In the classic Sherlock Holmes short story, ‘Silver Blaze’, Sir Arthur Conan Doyle chronicles the story of the missing race horse and the murder of its trainer. “Is there any other point to which you would wish to draw my attention?” asked Inspector Gregory. “To the curious incident of the dog in the night-time” said Holmes. “That was the curious incident” remarked Sherlock Holmes. In case of the NSEL scam or whatever you call it, it is quite clear that it was a systematic and premeditated fraud perpetrated by the company over years. One of the readers of this blog and a close friend went to the extent of suggesting that I must change the name of my broker friend Jigneshbhai, as the name is not trustworthy anymore. But jokes apart, the surprising, or should I say, astonishing incident in this case, is the complete lack of ‘barking’ by the watchdog i.e. the regulator. Equally surprising is the complete lack of outrage by anyone else – be it the media, politicians or others with stake in financial markets. Well – in recent and not so recent times – there have been many other instances of scams – like the Saradha chit funds, old plantation schemes, even emu scams of late – which may lead one to believe that we are not surprised by scams anymore. But in the first place, they were done by private, unregulated entities which everyone knew were unregulated. Instinctively, enlightened investors never believe a ‘ABC Plantation’ salesman or a ‘Saradha chits’ broker when he comes to sell things to you. Moreover, in some of these scams, one could, as an outside chance, entertain the notion that the promoter, perhaps, had some intent, at some point, of returning cash or kind in some form if he could pull the scheme off. Besides, while all of these were promoter frauds of some kind with political complicity, one could at least find some trace of an operation somewhere, and regulators could get away saying it was in an unregulated area. But in case of NSEL, here was a company that was supposed to be a spot commodity exchange. When you are an exchange, implicitly no one questions your legality. It was being sold by brokers to ‘high net worth individuals’ to increase their returns along with NSE futures and options. Like NSE, it even called itself National Spot Exchange. Almost everyone assumes when dealing with this type of company that it is regulated. When popular banks accept deposits, one doesn’t check if they have a license. Now we are being told – sorry, that was a wrong assumption, the structure itself did not exist. It was a Ponzi scheme. And officials say it was never a regulated entity. If it was unregulated, how is it that it was the only spot exchange and had monthly turnover of 25,000 crores? These questions have no answers. It is unclear where the responsibility lies and who is guilty. The people who lost money may have been rich, but in this case, the loss was not due to speculative risks, it was due to regulatory risks. For regular folks, it is a bit like going to a bank to redeem your deposits, and being told – well, the fixed deposit receipts you got were not valid, because this branch is illegal. Or you check your mutual fund or demat statement and when you want to sell, you are told the mutual fund or demat company is not legal. If Holmes were investigating the NSEL case, wouldn’t he question ‘the curious incident’ of why the Dog did not bark? Unfortunately we don’t have a Holmes. The investigations, hopefully, will tell more, but till then, the fact remains that the NSEL fraud is so brazen that it is only natural to question who and where the watchdog was, and why it did not bark. 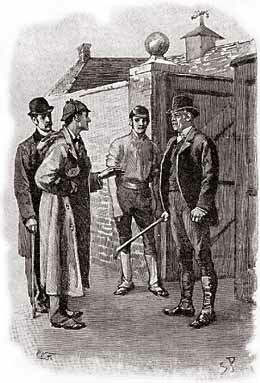 In the Holmes story, eventually we realize that the dog did not bark because he knew the thief. Dogs bark only at strangers, and the thief was not a stranger. If that is the case here too, then suffice it to say that, as regular investing folks, we are pretty much on our own here. I am not surprised that regular investors in India don’t trust equity markets and financial products in general, and have a liking for ‘physical things’ like real estate and gold. Because at least they are real. I can touch it and feel it. And I am pretty clear that if I am cheated, I am, more or less, responsible for it. Unlike financial markets, I am under no illusion that there exists a watchdog to protect me. A watchdog that does not bark. And seldom bites.